I'm a card maker. AND I love to save money. So, when I'm making cards, I like to be really efficient with my paper. So here's how I make the most of my card stock when making card bases. 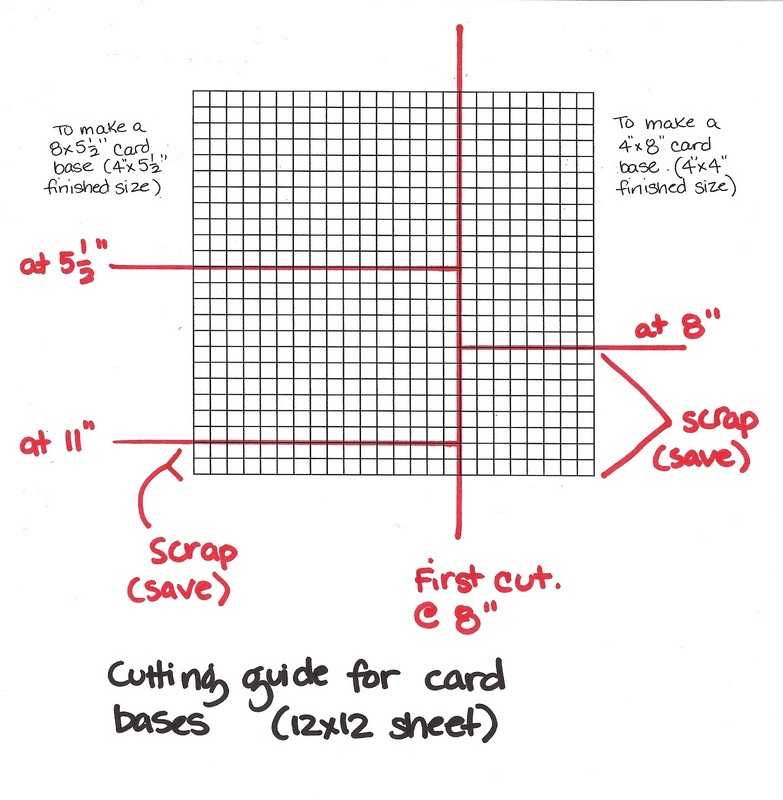 A "standard" size card is 4 1/4" x 5 1/2" (finished size). 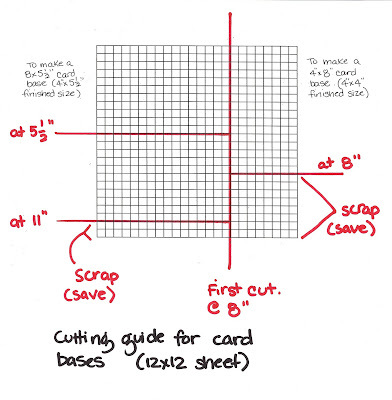 This is the card size that you would get if you took a regular 8 1/2" x 11" piece of paper and cut it in half to make 2 pieces that are 5 1/2" x 8 1/2". Then you fold that in half to make the finished card base. I usually make my cards a little smaller - 4" x 5 1/2"...I figure that no one will miss the 1/4". I start with a 12x12 piece of white card stock. I cut off a 4" strip, so the paper is now 12" x 8". Then I take the 12" x 8" piece and cut an inch off the bottom to make it 11" x 8". THEN I cut it in half to make the paper 5 1/2" x 8". When you fold it in half you get your finished card base. Yes, the base is now a finished size of 4" x 5 1/2" instead of 4 1/4" x 5 1/2" BUT I have a scrap piece that is 4" x 12". A 4" wide scrap is big enough to make another card. I usually make 4" x 4" cards, but you could also make a 4" x 5 1/2" card folded sideways. The envelope size for this "standard" size envelope is called "A-2." I think you can get A-2 envelopes in bulk (like a box of 250) at the big office supply stores. I like to get mine at Xpedx, because it's super cheap. Oh wow...this is a great idea. I never thought about doing this. That one quarter inch sometimes bothers me but I never thought about just cutting it off!